Mats Linder has just brought out the third edition of his Studio Manual, a big, fat 380-page PDF that helps users get the most out of SDL Trados Studio. There hasn’t been a new release of Studio, so why has the manual been updated? Well, the additions largely stem from user experience – Mats’ and ours – which means grass-roots content for real-life translators. What’s the difference between unconfirmed and draft segments? How can you assign Shift+Insert to paste text, like in other Windows applications? What happens if you enable the character-based concordance search? Where do you change settings options for your current project and when will they take effect? Do you need an INI file to translate a TTX? The number of apps available on SDL OpenExchange is growing fast and Mats has included many of the latest additions in his manual. Glossary Converter, Any-TM Translation Provider, SDLTmConvert and MultiTerm Widget are now included in this third edition. The manual itself is also available on the OpenExchange, by the way. Anyone who has already purchased the manual gets the updated edition (including a version with highlighted changes) for free. If you haven’t got a copy, it costs €34. (* See Paul Filkin’s comment below.) Why should you pay for a manual when you’ve already forked out quite a sum for the program itself? Well, you don’t have to, of course, because Studio already comes with a comprehensive online help section, but you’ll be missing out on a manual written by a translator, for translators. Let me turn that question over to you. What do you think? This entry was posted in 1. 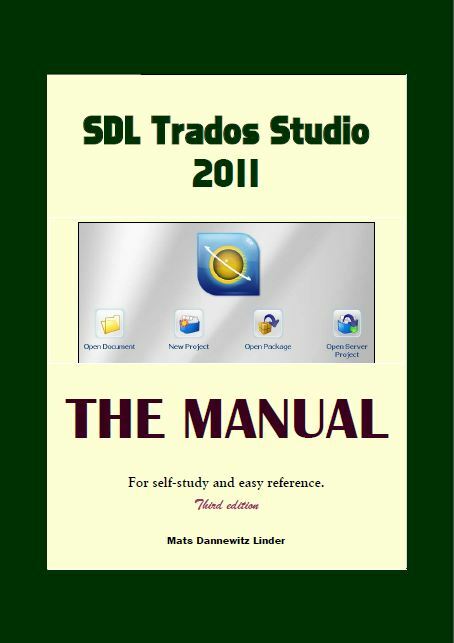 The Basics, Book reviews, SDL Trados Studio and tagged SDL, SP2, Studio, Studio Manual, Trados, update. Bookmark the permalink. Hi Emma, just thought I’d note that new users of Studio do get a low priced option to purchase the manual direct from Mats Linder already. I think this started around May. I agree with you that it’s worth having because the content written from the perspective of a Translator rather than someone who only knows how to use the software technically is very refreshing, relevant and helpful. Glad you blogged about the update though. Thanks for mentioning this, Paul. Great to hear that new users now get a low-priced option. I’ve added a reference to your comment in my post. I saw that you mentioned a couple of software for doing the autocorrections. If you just need to do autocorrections I think that Autohotkey is the best option. If you want to do more, for example store translations for custom terms or create a list of words that you use often and that you want to autocomplete, I’d suggest that you check out PhraseExpander as well at http://www.phraseexpander.com (adding and editing terms would be easier as well as you can do it from an easy to use interface and you don’t need to manually edit text files). Thanks for your recommendation, Andrea, although it would have been nice to say upfront that you’re from PhraseExpander yourself. In Studio, there’s already a good Autosuggest feature that is built from a translator’s own Translation Memories, so the autocomplete is quite well covered there. It’s interesting to see that PhraseExpander can also be used to autocorrect words, which is what is discussed in the Trados Manual, so it would be useful from that angle. Oh sure, sorry about that. You can use text expander software also to quickly open dictionaries or websites from inside Trados as well. I think comprehensive video trados tutorials should be made available and should be easily accessible. The same thing applies to written Trados tutorials, they should be comprehensive and always attached to SDL’s products. I am writing this both as a user and a customer. I agree, Jakub. In fact, in Studio 2014 there’s direct access to videos and PDF guides under the “Get started” and “More resources” of the welcome view. But the manual I reviewed here is a nice way of getting everything that’s covered in the Help files (and more) in a single PDF.